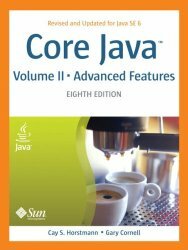 The revised edition of the classic Core Java™, Volume II–Advanced Features, covers advanced user-interface programming and the enterprise features of the Java SE 6 platform. Like Volume I (which covers the core language and library features), this volume has been updated for Java SE 6 and new coverage is highlighted throughout. All sample programs have been carefully crafted to illustrate the latest programming techniques, displaying best-practices solutions to the types of real-world problems professional developers encounter. Volume II includes new sections on the StAX API, JDBC 4, compiler API, scripting framework, splash screen and tray APIs, and many other Java SE 6 enhancements. In this book, the authors focus on the more advanced features of the Java language, including complete coverage of Streams and Files Networking Database programming XML JNDI and LDAP Internationalization Advanced GUI components Java 2D and advanced AWT JavaBeans Security RMI and Web services Collections Annotations Native methods For thorough coverage of Java fundamentals–including interfaces and inner classes, GUI programming with Swing, exception handling, generics, collections, and concurrency–look for the eighth edition of Core Java™, Volume I–Fundamentals (ISBN: 978-0-13-235476-9).